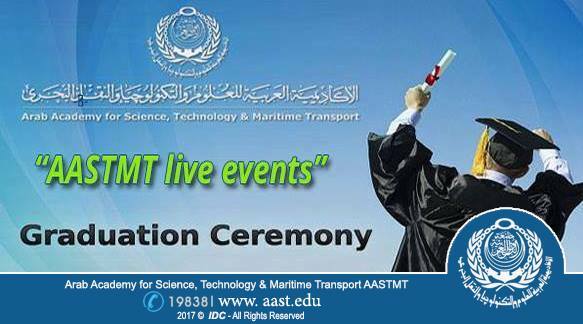 It was decided to hold the Graduation Ceremony of AASTMT Alexandria Branch “College of Management and Technology” (Classes of June - September 2017), on Tuesday 12- 9- 2017, at 8:00 pm, at Radisson Blu Hotel - Alex West – Alexandria. The house of supply chain excellence- adopts continuous improvement to create, preserve, and disseminate applied knowledge with excellence through graduates& education, research, training, & consultancy services in the fields of international transport, logistics & law. Arab Academy for Science, Technology & Maritime Transport, El Moushir Ahmed Ismail Street behind Sheraton Bldgs.